I thought that was dumb. After all, I didn’t think of myself as a girl, and I LOVED the stories about Nancy and her friends—especially her friend George, who had a boy name even though she was a girl. Who wouldn’t be into solving mysteries and going on adventures? Eventually I met a girl who enjoyed the books as much as I did, and we bonded over that, even though I had a hard time connecting with her on other interests that I thought were “too girly.” Those stories brought us together and helped us explore ideas about who we were and who we wanted to be. Sometimes being a gender-expansive person in Christian spaces can feel a bit like having an unusual hobby, or being into a lesser-known book series. There’s something about this Christian story you connect to, but very few of your LGBTQI2A friends are interested, or, inversely, there’s something about the stories of queer and trans folks that you connect to, but your Christian friends don’t want any part of it. The false binaries that we create and the lines we draw between Christian and LGBTQ+ or between men and women keeps us from connecting, and from seeing each other for who we are. As an adult coming out as transgender, I drew strength from the stories of other gender-diverse people—from trans leaders like Marsha P. Johnson and Leslie Feinberg, to biblical characters like Deborah and Joseph, to new real-life friends who told me about their lives and experiences. I also grew more comfortable digging into the language used for and stories told about God, and asking questions about how God relates to our human ideas about gender. Is God like a loving father, like a wise mother, or both? What do our stories about God tell us about who we are, as image-bearers? Stories can connect us horizontally to each other, vertically to God, backwards to our ancestors’ stories, and forward into the communities who will come after us. At this year’s Trans and Gender-Expansive group meeting at the Q Summer Retreat we’re going to bring our stories together and find ways to connect the dots. You’re not the only one who’s into the stories of our faith, and you’re not the only person navigating the waters of this gender sea! You’re part of a legacy of bold and gentle adventurers, and we can’t wait to meet you. Read more about the Trans and Gender Expansive Retreat from Laura Beth Buchleiter and don’t forget to register for the Summer Retreat! Is the mirror your friend? When someone asks you to introduce yourself or to “tell us a little bit about you” does anxiety grip your throat and steal your ability to make a sound, let alone utter a complete sentence? Does your concept of who you are seem so far at odds with what the world may see that even meeting someone new seems like an unthinkable task? There are many reasons any of those scenarios might describe your reality. In my own experience, living with Gender Dysphoria drove my social anxiety to unbearable levels such as those. The disconnect with who I knew I was and who I was expected to be was an ever-present, shrill alarm in my head telling me I was not worth the effort. I made the effort to manage the situation. I worked with a body image specialist who had me attempting to stand naked in front of a mirror for 5 or 10 minutes at a time affirming the reality of what I saw. Gender Dysphoria and body dysmorphia, as it turns out, are not to be treated the same way. I knew exactly what I saw and it didn’t fit. When that didn’t work I consulted with dream analyst. Perhaps, I was told, the subconscious effects of trauma were causing misguided perceptions of self. If we could tap into those thoughts and understand where they were coming from, then we could “correct” my perception of self and understanding of reality. Gender Dysphoria and Post Traumatic Stress, as it turns out, are not to be treated the same. Mode after mode, specialist after specialist I did everything I could address the fear, frustration, and physical pain that dominated my life. Everything, that is, expect accepting and loving myself. Then the door was opened to the idea that God didn’t need anything “fixed” for me to be loved. It wasn’t just one counseling session, or even one counselor. It wasn’t one seminar or retreat or workshop or book or class or sermon. It was a cacophony of seemingly random voices all coming together to reinforce the notion that I am lovable: Able - To - Be - Loved - by God, by others, and - most of all - loved by me. The more voices we have present in our lives reasserting that truth, the deeper it gets rooted into our realities. While the dysphoria is not completely gone and the insecurities and self doubt are often still my default way of thinking, they are no longer the only message in my head. The chill alarm they used to represent is drown in a chorus of affirmations and soft chimes of acceptance. Listening to those new, affirming, voices has allowed me to bring my perception and presentation of self into accord and to willingly share myself and my story with others. Embracing the notion that I have value as an image bearer of the Divine has allowed me to finally make friends with the mirror. Also, I’ve come to appreciate any opportunity to be that voice to others on their journey. I hope and pray that we can be that voice to one another as we gather this summer in Ft. Lauderdale. 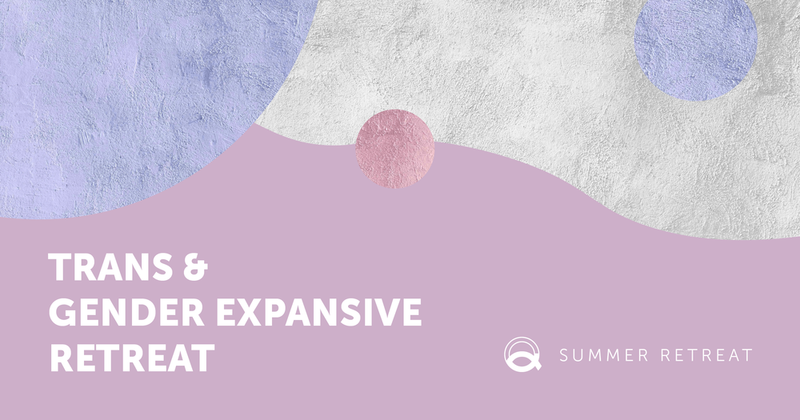 Read more about the Trans and Gender Expansive Retreat from Austen Hartke and don’t forget to register for the Summer Retreat!